When the Grundy family purchased this home in 1884, they set about turning the existing structure into a fashionable, modern house. The home was remodeled in the Queen-Anne-style that combined modern conveniences and technological innovations of the day with a nostalgic styling that recalled an earlier, less industrial time. 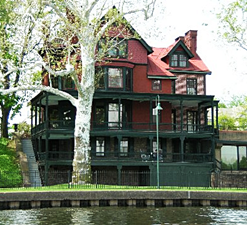 The home's location along the banks of the scenic Delaware River provided the perfect place for the Grundy men to retreat to after long days directing operations at the Grundy Mill. Today, the rooms of the Grundy Museum are appointed as if the family has just stepped out for the afternoon. Come for a visit and experience life in the late Victorian period through objects and furnishings that the family themselves used. All ages are invited to take a free guided tour and learn about the life of one of the Keystone State's most powerful politicians. 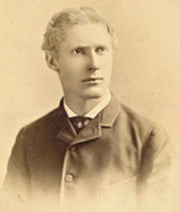 Joseph Ridgway Grundy was born on January 13, 1863. The only son of William Hulme and Mary Ridgway Grundy, Joseph was named to honor his maternal uncle - Captain Joseph Ridgway - who died one month prior, a casualty of the Civil War. Joseph was a teenager when his father moved the family and his woolen business to Bristol Borough. Upon his father's death in 1893, Joseph took control of his family's interest in the mill and broadened his investments and involvement in the region. 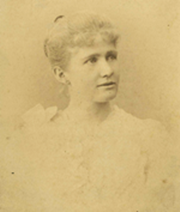 Margaret Grundy was devoted to the Bristol Free Library where she served on the book selection committee. Her generosity was a primary funding source for the local library. Her brother Joseph, also a library advocate, provided rent-free space in a frame structure at Dorrance and Cedar Streets to house the library's operations. Margaret's lifetime of dedication to the small town library inspired Joseph to begin planning a new, modern facility for the borough.